Once again, March Madness builds to a crescendo this weekend, with the “Final Four” basketball bouts set to dominate the Saturday spotlight. For many sports fans, this is an excellent time to debate what it takes to be a winner on the court — but for those of us focused on the country’s schools and classrooms, the more important discussion should center on what makes a school a champion in a student’s life. As we have done for the last two years, to help ground this conversation in facts, we have created a parallel bracket that takes all 64 of the initial NCAA tournament participants and plots them on an “Income Mobility Tournament” bracket, based on how well each school helps its students reach the American Dream of upward mobility. A big part of the American Dream rests on the idea that children will do better than their parents. As the nation’s economy has expanded, that has been accomplished mostly through better technology, better health care and other trappings of modern life. But the American Dream also has an upward mobility Horatio Alger component. It is not only that everyone should have the opportunity to be better off, but that everyone has a shot at rising up the ladder of income distribution. However, most Americans, viewing higher education as the gateway to opportunity, worry that colleges are not helping students and families move up that ladder. But while some colleges do not, many are holding up their end and contributing to the American Dream. 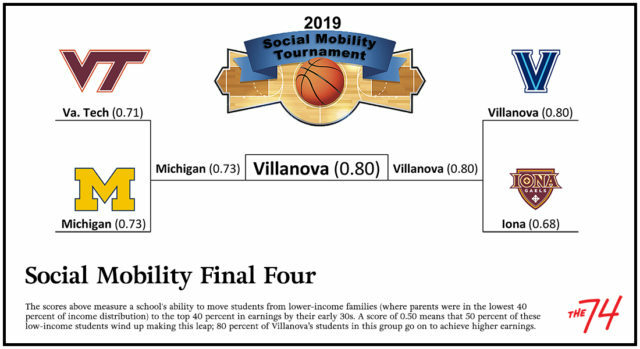 Our parallel mobility bracket permits us to compare how well schools that are successful in basketball (they made it to the Big Dance) also succeed at putting their students on the road to financial security. Unlike the NCAA bracket, whose final shape can be known only when the last tournament game ends, the bracket we present here has been fully filled out with the participating teams because it is based not on what schools might do, but on what they have already done. Our calculations of mobility scores rest on a data set created by the Harvard-based Equality of Opportunity Project, which combines millions of anonymous income tax returns with information on thousands of American colleges. In the previous versions of our parallel bracket, we mapped each team’s school using a mobility rate that represented the percentage of its students ages 19 to 22 in the early 2000s whose parents came from the bottom 20 percent of the income distribution but who by 2014 had managed to reach the top 20 percent. However, given the increased attention given by the public and policymakers to students’ post-college earnings (and to the student loan debt they carry), this year we have calculated student mobility differently. For 2019, our adjusted mobility rate calculates for each college the percentage of low-income students — those who originated in the bottom 40 percent — who reached earnings in the upper 40 percent of household income by their early 30s. We believe this adjusted mobility score provides a more informative view of how well schools are serving as ladders that can help students reach the American Dream, which for most is not about reaching the very top but rather gaining a foothold on the upper rungs, where secure, family-sustaining jobs are found. To make sense of the results of the 2019 Income Mobility Tournament bracket, note that a score of 0.50 means 50 percent of students whose parents were in the lowest 40 percent of income distribution were able to climb by their early 30s to the top 40 percent in earnings. While all the colleges in the NCAA tournament dream of winning games and advancing to the Final Four, only the top-performing few have much to gain from winning besides bragging rights and the momentary joy of defeating their opponent. For most players, participation in the NCAA tournament will likely leave memories that will last a lifetime, but only a small number will be able to translate this exhilarating time into a source of lasting economic reward. Indeed, less than one senior in 75 playing in the tournament will be lucky enough to be drafted by an NBA team. Making the NCAA bracket is, then, mostly aspirational for the majority of colleges and players — a motivating, self-affirming and thrilling experience. In contrast, a school that scores high in the mobility bracket is one that is putting low-income students on the path to a life-transforming future of financial well-being. In effect, winning a basketball game feels good, but being on the road to success is good. It is in that spirit that succeeding in the Income Mobility Tournament represents a reality that needs to be praised and celebrated. Schools with a record of helping the nation’s millions of first-generation and underserved students succeed are not only doing a good thing for their students, they are helping to form strong families, civic-minded communities and thriving local economies. 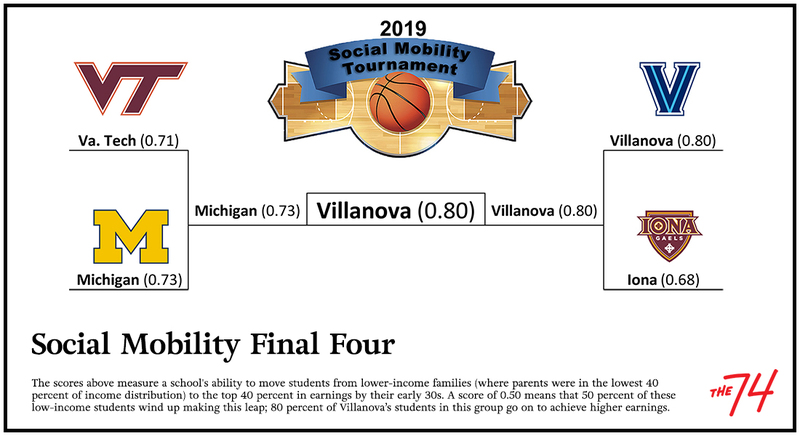 Among the colleges in this year’s Income Mobility Tournament that most deserve our praise — no matter how they fare on the court — are the top two contenders: Villanova (0.80) and Michigan (0.73). At Villanova, eight out of 10 students and at Michigan nearly three out of every four students (a combined 3,350 each year) who went to college when their parents’ earnings were in the lowest 40 percent of households had reached incomes that placed them in the top 40 percent of American families by their 30s. Of note for Californians: UC Irvine makes it to the Sweet Sixteen in this bracket, where 70 percent of students who entered college when their parents’ earnings were in the lowest 40 percent of households had reached incomes that placed them in the top 40 percent of American families by their 30s. Both Villanova and Michigan are categorized as “Most Competitive” in Barron’s Profiles of American Colleges — so perhaps their mobility rates are not all that surprising. But even modestly “Competitive” schools, such as Iona (which made our Final Four) and Saint Mary’s, which accept over 75 percent of their applicants, managed to do nearly as well, with adjusted mobility scores of 0.68. Our research points out that while many schools that succeed in setting their students on the path to upward mobility are very selective, many are not. And, as in the case of Iowa State and Fairleigh Dickinson, they not only help a high percentage of their students succeed (0.65 and 0.62, respectively), but these percentages represent thousands of students who have reached solid, family-sustaining wages (around 3,400 at Iowa State, about 1,300 at Fairleigh Dickinson). In the previous two years, the mobility tournament champion was UCLA. Had the Bruins made it to the NCAA tournament this year, they would have placed in the Final Four of our parallel bracket with a praiseworthy score of 0.70. But as good as that score is, this year they would have fallen behind three of our Final Four schools. At the other end, it bears noting that the winning schools in the mobility bracket’s low-seeded First Four competition all managed to launch over 60 percent of their low-income students to the top 40 percent of the income distribution — that’s over 14,200 students in a single year! Clearly, these are schools committed to both economic diversity and the financial advancement of their students. While gallons of beer will be consumed by winners and losers as the NCAA tournament proceeds, we should all raise a cup in celebration of the colleges that are truly the heroes of American postsecondary education—those schools like Villanova and Michigan and UC Irvine that can transform the dream of upward mobility into a reality for thousands of disadvantaged students. Jorge Klor de Alva is president of the Nexus Research and Policy Center. He was previously a senior executive at Apollo Education Group Inc., a professor at Princeton University and the Class of 1940 Professor at the University of California at Berkeley.